(clockwise from the top) Terry Naturally Pure and Beautifying Facial Oil comes in those little ampuls that I remember beguiling me as a child. They always feel so luxe which makes these extra unique considering this is also a natural line. Filled with organic oils such as rose, biter orange and pomegranate seed this helped my very chapped skin overnight. Oils are usually a big no,no for me but this was a really pleasant surprise. Tatcha Aburatorigami Beauty Papers are laced with gold flecks and come beautifully wrapped. 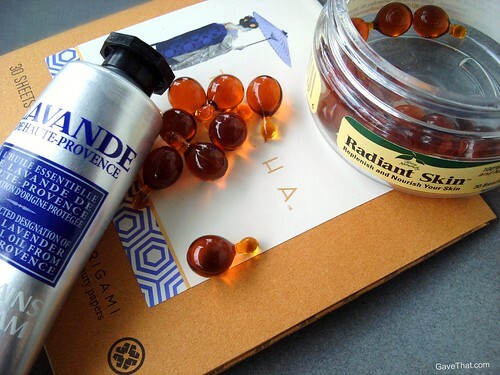 See my previous post here for more on them along with their Radiant Serum. 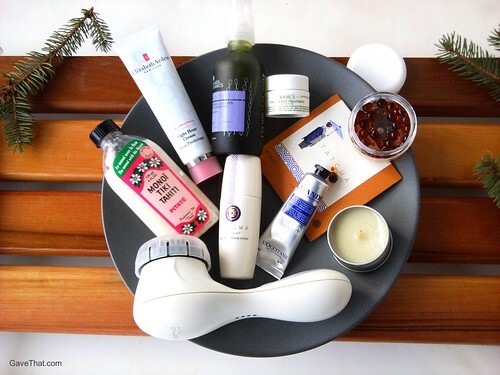 L'Occitane hand creams have made it into gift guides over and over because they're lovely top pop in a purse and are very healing. See more here. Next to those you'll find a little travel candle by PaddyWax. Every single one of their scents that I've tried is beyond exceptional and so much richer than their price. Real gems. 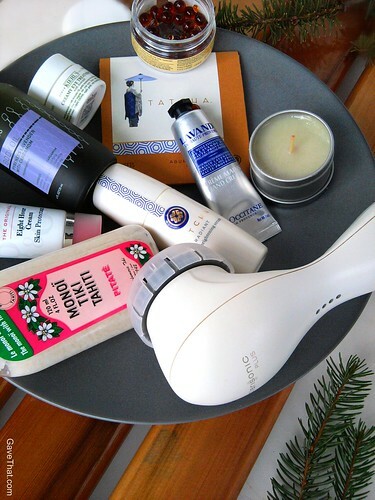 Something still on so many beauty wishlists, the Clarisonic Plus for all over the body and the face. It's beyond, beyond. See the full review here. Monoi Tiki Tahiti flower oil, the original. See all my cooing about it here and it's OK if it solidifies and turns white. Drop it in a warm bath and it will revert back to oil. The cult favorite Elizabeth Arden 8 Hour Cream which isn't really a cream at all but a runny salve. See more here. Pangea Organics makes incredible products that smell so good, especially if you love essential oils and Aromatherapy. A real favorite is their body oils which are light and sink right in but still feel moisturizing. Then a little pot of Kiehl's creamy Avocado eye cream, which has shown up here before and deserves another shout out. Even though it's very rich and sticky, staying in place, it never caused problems and is extremely hydrating. After slopes fix. Lastly, what everything is resting on, a handcrafted cedarwood spa bench which was one of the absolute best discoveries of the year. See all about it here and how to order one or a few too.